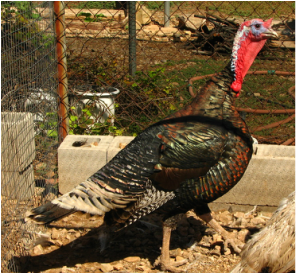 Unlike the commercial broad-breasted Bronze turkeys, the Standard Bronze is a true heritage turkey and able to breed naturally. This is one of the largest varieties of the heritage turkeys, with standard weights of 36 lbs for old toms and 20 lbs for old hens. The feathers have a beautiful iridescent rainbow of colors in the sunlight. My Bronze are descendants of the Norm Kardosh line.